i'm assuming that we all have similar mornings every now and again. the wind is rattling the window panes aided and abetted by lashings of rain and because we've put the clocks back (in the uk at least) even though it's nigh on 7:30am, it still looks and feels like the middle of the night. snuggled up in bed, under a duvet that has more togs than your bicycle has gears, the thought of having to get up, never mind going out on the bike, has probably been pushed as far to the back of your mind as it can possibly go. this may or may not be regarded as a realistic setting at present, though with galeforce barney currently doing precisely as i described above, it would be a far stronger person than i who would venture outdoors on foot at the moment let alone in the saddle. and in only a matter of weeks, the annual festive 500 will come round once again, when this scenario will more than likely play out every morning between christmas eve and hogmanay. and assuming challenges are your thing and only fools and horses isn't, there's quite possibly no option but to force yourself out of that snuggly, cosy bed and assume a pelotonic mantle. i have, however, found the perfect solution to such a dilemma, one that combines both of what graeme obree regards as man's greatest inventions: the bicycle and the duvet. perhaps better known for their excellent wheels, mavic have borrowed their best known apellation and re-applied it to a curated collection of clothing. in other words, the ksyrium pro thermo kit. though available individually, the thermo kit consists of a long-sleeve baselayer, the thermo jacket, thermo bibtights and the totally excellent thermo shoes. crafted from a polyamid/merino wool blend with a smattering of elastane, the white baselayer sent by mavic appears as the very brightest of whites more ususally seen in washing powder adverts. in order to maintain this impressive level of white, i'd suggest washing it separately from the darker colours featured on the rest of the set. the baselayer offers impressively long sleeves and a very snug fit. however, since you're going to be wearing this under that thermo jacket, any bumps and bulges that may have accrued now that racing is over will be suitably obscured. 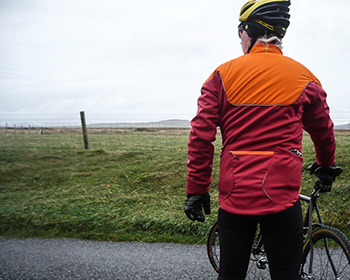 mavic's ksyrium pro thermo jacket is quite possibly one of the finest inventions now known to cycling-kind. it actually consists of two jackets: a thinner fleece jacket zipped into the thicker outer garment. not only is it a fully featured, long sleeve jacket, with a nice waffley material at the sculpted cuffs, once unzipped it can be worn as a separate jacket, something i tried out under a waterproof softshell. the outer jacket is the piece de resistance with two vertical zips on the front to mediate the temperature should such be necessary along with a single zipped pocket. the latter is augmented by two rear outer pockets and a centre zipped example just above a dropped tail. it's thermal properties are provided by a primaloft sport filling which is pretty much from whence my duvet comparison comes. though mavic do not promote the jacket as fully waterproof, it does provide a decent level of water resistance via a durable water repellency coating. my medium size review sample was an excellent fit, though if you're removing the inner jacket, it's bound to be a bit looser over the top of the baselayer only. the third component of mavic's thermo collection consists of a pair of super-roubaix lined bibtights. their thermal properties make them a lot less skintight than their pelotonic brethren, but in view of their employment prospects, this really isn't a problem, particularly as flappage has been totally excluded. the lower calf portions feature zips to ease fitting and removal along with a couple of elastic foot loops to keep all draughts at bay. they also feature mavic's ergo 3d pad, one of the most comfortable on the market. though it seems rather thick when first worn, in practice it's all but invisible. you could ride all day on this without a hint of discomfort. mavic state that these zips fit perfectly with the ksyrium thermo shoes which i initially took to mean that they could be zipped over the top of the ankle closure on the footwear. 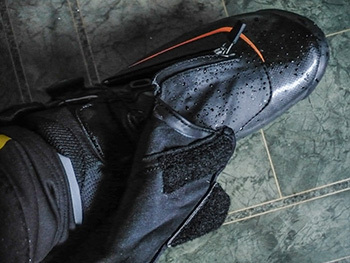 it seems i was wrong on this count, for though we're talking thermal rather than waterproofing here, doing so would surely prevent water soaking from the tights into the shoes/socks? however, i really have no objection to the current means of keeping me snugly warm. the shoes vye with the jacket as to which component will be your eventual favourite. with details refined over years of providing superb footwear, the fit here is close to perfect. a goretex lining provides an almost unheard of degree of breathability in a shoe with no visible vents. 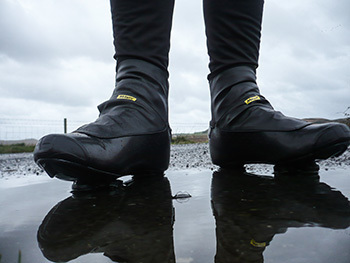 closure is by means of mavic's ergo dial variation on the boa system, coupled with a top zipped enclosure matched with a neoprene ankle closure that is velcro'd in position when the shoe is comfortably fitted. thoughtfully, this dial is still easily adjustable after all closures have been made. the sole is a combination of fibreglass and nylon which provides a stiffness comparable to the more usual carbon. though the rest of the set offers mere water resistance, these seem almost impermeable to water. believe me, they have been tested through driving rain and floods on more than one occasion. mavic's press release describes the ksyrium pro thermo kit as being engineered for extreme cold weather riding and i have very little doubt that you could cycle across the antarctic ice shelf without so much as a shiver, but i fear that mavic do themselves a disservice. my first ride thus clad was in eight degree ambient temperature, lowered by windchill to around five, yet i was as snug as a bug in a rug, so it's not the idiosyncratic purchase that it may first appear. the duvet supremacy. with a tailwind, i simply opened the zip at the neck and both front vents; when turning into a strong headwind, even though energy expenditure improved internal heat production, the wind was cold enough to have all the above fully closed. if there's a fly in the ointment (pardon the pun on a forthcoming detail) it's with the bibtights. 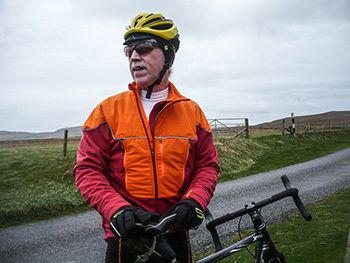 the front panel reaches to just below the chest, meaning there is simply no way you're ever going to manage a natural break without removing the jacket or jersey and slipping off the bibs. if it's cold enough to be wearing bibs and jacket in the first place, that's a tad inconvenient. a front zip would have been more than welcome. 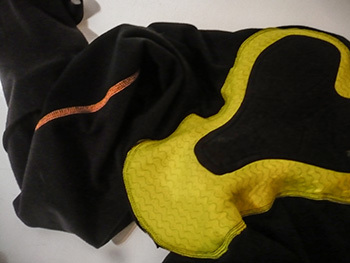 this detail aside, mavic's ksyrium pro thermo kit is little short of marvellous. 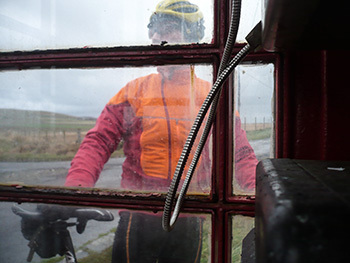 it truly is like riding round wearing a duvet all day and in bright, yet subtle colours that identify your presence to any traffic you might meet on cold, grey and overcast days. the two piece jacket is a wonder to behold; i wore them as two separate garments, allowing me to divest myself of the outer when popping in for some coffee and a double-egg roll, yet storing the heat within the inner jacket. if anything, the bibtights verged on being just a smidgeon too warm for their own good, but under the suddenly cold conditions, i much preferred an excess of heat to the alternative. 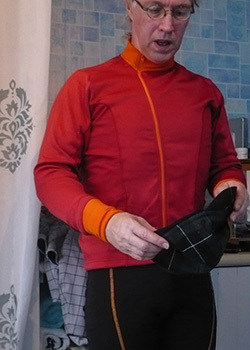 i also had the opportunity to wear the inner-jacket along with a waterproof softshell on a three hour ride of driving rain. its thinner constitution, when separated from the outer shield, only underlines the versatility of mavic's technical prowess. this makes the latter item a decent alternative to wearing a long-sleeve jersey without the bulk but with all of the insulation. even when caught in a rain shower about eight kilometres from home, the water resistance proved better than advertised, while none of the thermal properties were diminished in any way. i am desperately hoping for much lower temperatures this weekend so that i can once more inhabit the duvet supremacy.